Here at Who What Wear UK, we're all about delivering the latest and greatest shopping edits, as approved by our team. 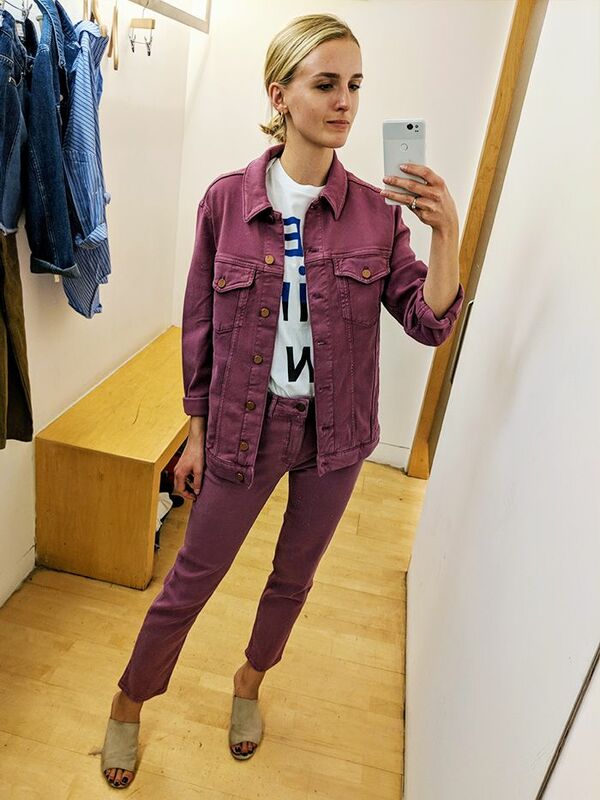 That's why we've created this offshoot shopping column as part of our We Try Before You Buy franchise, which will see me, Joy Montgomery, heading to all your favourite stores to test out new-in pieces IRL. 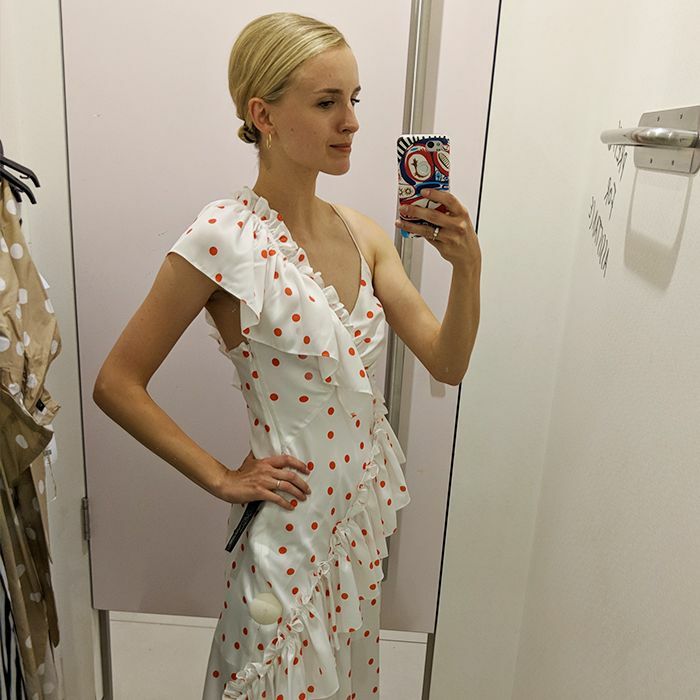 From summer dresses to intriguing new brands, prepare for changing room selfies aplenty. Is there something you'd like me to cover? Make sure to tweet or Instagram me your requests! From the sexual liberation of the Mary Quant mini and the furore surrounding The Daily Mail's "Legs-It" headline to teenage boys demanding sartorial equality by donning school skirts, there's no denying that the skirt has a politically charged past. It's often been suggested that there's a connection between skirt lengths and the country's finances: According to the Hemline Index, rising hemlines are a reflection of economic prosperity. Like this season's obsession with It dresses, the skirt has been making a bid for star status in our wardrobes. Case in point: Réalisation's leopard-print midi skirt, which celebrated viral success soon after its release and has gone on to see multiple restocks and sellouts. No item of clothing is immune to the cult-buy treatment. With this in mind, it seemed only natural that skirts should be my next shopping subject. What did I discover on my travels? As previously mentioned, longer lengths are the order of the day, particularly in silky fabrics. Co-ords are also undeniably having a moment, with many skirts sold alongside colour- and print-matching blouses. If you're a miniskirt lover, worry not, as there are plenty of options for you too—particularly in corduroy and denim, which are both set to be trends for A/W 18. Scroll down to shop the full edit. Style Notes: I thought I would start the proceedings with a bang with this Barbie-pink number from Topshop. 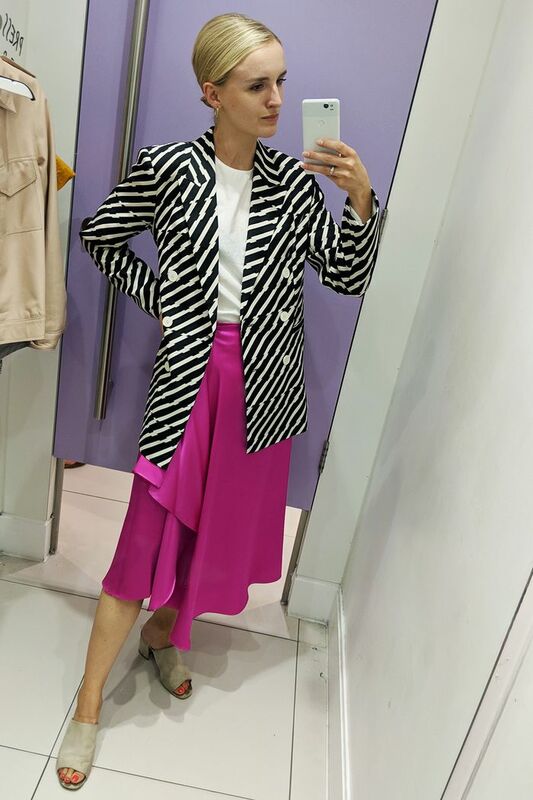 I styled it with a structured monochrome blazer to balance out the brightness and floaty silhouette of the skirt. Style Notes: This summery skirt from Arket was so comfy, mostly thanks to the stretchy waistband and flowy fabric. There's a risk that a midi floral skirt can look a bit twee, so I tried to add a modern edge with an untucked tailored shirt. Style Notes: The vintage nerd in me got excited when I saw this '60s-style cord miniskirt, which looks like it could be the real deal. I loved the belt detail and A-line shape—all it needs is a ruffle-neck blouse and a patent biker jacket for serious throwback vibes. Style Notes: Check is set to be huge next season, and I was drawn to the thick fabric and granny-ish aesthetic (in the best way possible) of this Topshop midi skirt. A boxy leather jacket in the softest shade of pink is a perfect addition. Style Notes: The Who What Wear offices have been going mad for this & Other Stories rust-coloured skirt, and I can certainly see why. The fabric has a lovely drape and fit, making it look much more expensive than £59. Make it instantly party-ready by pairing it with & Other Stories' sheer velvet dot top. Style Notes: Clean-lined and unfussy, this Arket wrap skirt is a great option for minimalists. The waist-cinching style will look flattering on all body types, however, it's worth noting that sizes do come up slightly small. This is at the top of my A/W 18 wish list. Style Notes: This is such a stunning look from Zara. I'm a big fan of khaki, and it looks great when rendered in a textured fabric. The two pieces work so well together, however, the shirt's neckline was a little "gapey," so I'd personally wear this in winter with a polo layered underneath. Style Notes: Another checked look from Topshop, but this time with a splash of highlighter yellow. This was one of the pieces I came close to buying, as I can totally see myself wearing it constantly in autumn with heeled boots and an oversize knit. Style Notes: Zara co-ord number two. This feels a little more summery than the previous look, but I like the paper-bag waist and button detail on the skirt. The top was a fun addition; however, even with the high-waisted skirt, it flashed more midriff than I would like. Style Notes: I had to include an animal-print skirt in my shopping roundup—they're literally everywhere at the moment. This option from & Other Stories comes in a chic, expensive-looking fabric, but personally I felt the need to add a chunky jumper to avoid any Janice from Friends connotations. Style Notes: A departure from the silky styles dominating the high street at the moment, this Topshop pinstripe skirt offers an unusual twist on an office staple. I like that it manages to make a statement without being a crazy colour or print, but that being said, I think it looks best when paired with a simple top. Style Notes: Confession—my husband told me I looked like an air hostess when he saw this look (ah well, can't win 'em all), but I personally loved the quirky '60s vibe of the cord fabric and the dusty-blue hue. So there. Style Notes: I'm drawing inspiration from Meryl Streep in Out of Africa with this safari ensemble. Fashion editors and bloggers alike are into the tonal trend this season, and I'm also a big fan. It's such an easy look to put together (essentially just combine pieces of the same colour palette), and it will instantly make any outfit look expensive. Style Notes: This snakeskin skirt from Zara would be a dream if it wasn't such a strange texture; however if you can get past the faux-leather effect, I reckon you'll get a lot of mileage from the piece. Style it with an oversized short-sleeve shirt while the weather is still warm, and then, come winter, pair with white boots and a cosy knit. Style Notes: You can't go wrong with a bit of double denim. Midi denim skirts have been the star of the show for most of 2018, however, over the last couple of months, we've seen noughties denim minis making a bid for the spotlight. Arket's dark-rinse iteration is a great interpretation of the trend and manages to still look modern due to its minimalist finish. Style Notes: This is the second skirt I came close to buying. I don't usually go for a pleated skirt, but this & Other Stories piece was surprisingly flowy and looked so distinctive in a mint green–and-pink check. Invest in the matching shirt for an easy Instagram-ready ensemble. Up next: We've found the shoes that go with everything you own.